I have to admit that one of the reasons why I enjoy my floral design classes is because I love looking at flowers before they are arranged. Yes, it seems opposite of what a floral designer would say, but it's true. 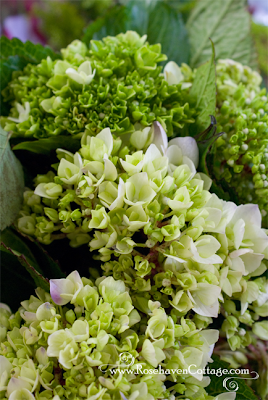 My whole life, I've been enamored with the big displays of bunches of flowers in florist shops, grocery stores, and sidewalk flower vendors. Seeing all the flowers grouped by type rolled up in cellophane sleeves waiting to be purchased just makes something inside me leap. 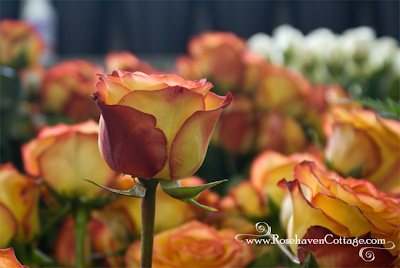 So you can imagine what I must be feeling every time I go in to floral design class and get a chance to open up the large refrigerators that are there to see them filled with flowers recently purchased at the flower mart. I'm in heaven! Yesterday, all the floral design students had a particularly significant opportunity to go in on a non-class day and assist our instructor with a wedding job she had for this weekend. It wasn't mandatory that we be there--strictly voluntary. Many of us embraced the chance to fine tune our skills that we'd been learning in class by applying them in a real world setting of the mass assembly of corsages, boutonnieres, cake topper pieces, a flower girl basket, carry-pieces for the bride and her bridesmaids, table arrangements, and altar sprays. There's a lot of work that goes into producing so many wedding flower arrangements including the prep work in getting the flowers cleaned up and ready to be arranged. Our classroom was full of helpers as well as the wonderful aroma of flowers (the same aroma that hits you when you walk into a florist). The classroom fridges had to be emptied of the buckets of flowers used for our classes so there was room for the wedding flowers after they were arranged. Then added to that were the bunches and masses of wedding flowers in buckets waiting to be assembled into the various wedding arrangements. I was loving life! We all assisted with so many jobs from prepping, to arranging, to sweeping and clean-up. Fortunately, I had brought my camera with me and took a break in the middle of the afternoon to take some photographs of my finished work and also the flowers in their pre-arranged state. I have to say that my favorite photos are of the latter. I stayed until the lights were being turned out in the evening. My eyes were bleary but my heart was singing because I had been surrounded by so much floral beauty all day long. Don't worry... I'll share my finished arrangements (I've already posted them to my Facebook album). But for now, I wanted to feature shots of the flowers before they were arranged--the sights that made me happy I'm taking these classes. In Toronto, we have a floral auction, similar to the one in Holland. It is amazing to see thousands of cut flowers for sale, the smell is incredible. M'dear, I could never have guessed you love flowers! (smile) But it is an interesting tidbit to know you love them in their less formal bunches Before they get arranged. There is something wild and spontaneous and free about them that way, isn't there? Will have to go check your facebook photos. Such beautiful photos of beautiful flowers. What a sensory treat! such beautiful photos..makes me want summer back again already!! Cindy, I think your bliss is showing. LOL. Girl, you are sounding so happy with what you got to do that day. 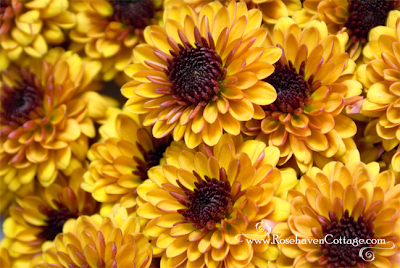 What great shots, and I especially love the chartruse mums, that is one of my favorite colors. My sister in law is like you! She takes me to the flower mart and I watch her wander up and down the aisles. A small smile turning up her lips, she looks at all the bouquets, touches a few, makes her choices. Like me in a knit shop. I know what you mean I enjoyed seeing the flower stalls in Columbia road earlier in the year. I have always wondered at what temperature you have the fridge on for flowers must look it up some time. Cindy, have you read "Flower Confidential" by Amy Stewart? I think you might have told me you have, but if you haven't, I know you'd love it! Those green mums made me think of it. I especially like the first photo here, of the roses. I'm so glad to hear the joy in what you write. It's heartwarming to witness your journey and to see you find and enjoy your bliss.